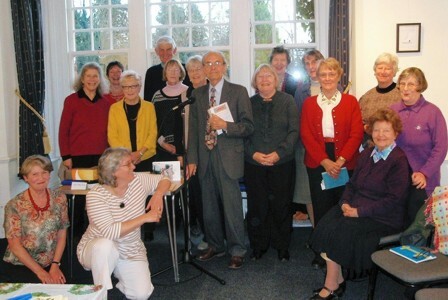 Shortlands Poetry Circle – Celebration of 100 years of poetry shared. The Poetry Society Shortlands Centre was formed in 1911 by Miss Catherine Punch, as an affiliate to the Poetry Society, which was founded in 1909. The Centre’s stated aim was to “promote the study and appreciation of poetry” and it has been going strong and remained true to that aim ever since. In November 1946, at an extraordinary AGM meeting, it was agreed that “The Centre now constituted should be dissolved and the group be reformed in connection with the English Association” and became the ‘Shortlands Poetry Circle Northwest Kent Branch of the English Association (late Poetry Society Shortlands Centre’. Thankfully, it has since settled with the shorter version we know today, ‘Shortlands Poetry Circle’, and its affiliation is now with theBromley Arts Council. The Circle has maintained a formal management Committee and faithfully passed its meeting records, Minute Books and accounts from generation to generation, along with ephemera, newspaper cuttings and correspondences, so that its full history is available to us as we prepare for our Centenary year; and as we look to the future, we have resolved to take care, with the recent advent of electronic correspondence (recent to the Circle, since taking out an internet presence on the poetry p f website in April 2007) to print and retain significant correspondences and materials to add to these records. In 1943, it was agreed that an annual ‘Gazette’ would be produced and made available to the membership, with the President as Editor and all members invited to contribute. In 1944 “The Committee was unanimous in their approval of the suggestion made by the President that the Gazette should be continued but that all contributions should be anonymous.” This Gazette was the fore-runner of the Portfolio, now a selection of Writers’ Group poems (not anonymous!) produced annually by the Writers’ Group. The Writers’ Group was officially formed in 1947. Each year they contribute three poems to the Portfolioand present a reading to the Circle at one of the scheduled meetings. They have produced celebratory anthologies at important dates over the years: at the 60th, 80th and 90th anniversaries of the Circle, and in 1997, for the 50th anniversary of the Writers’ Group. A new anthology, each passing breeze, was published in January 2011 to celebrate the Circle’s Centenary year. The Circle also operated a Drama group for many years (see attached Programme, Spring 1946) which was “temporarily suspended” in Autumn 1981, though there was no record of it having resumed meetings up to 1988 (see Programme Snippets 1966 – 1988), and it no longer meets today, but is still allowed for in the Rules. The Circle continued their meetings during both World Wars and records suggest that only two meetings have ever been cancelled, the latest in February 2009 because of the dangerous weather conditions of excessive snow and ice. Members continue to meet twice a month during term-time to share poetry on defined topics or by particular poets. The schedule is defined annually based on suggestions made by members and by researching important anniversary dates, such as births or deaths of poets whose work has ‘gone into the annals’ and, every Summer, one of the meetings is devoted to a Celebration, with an invited poet (or poets) and a lavish buffet supplied by members. In recent years, the Circle has been invited to give voluntary readings as outreach – at Care Centres, Residential Homes, festivals and as performance – and have embraced this opportunity to extend the Circle’s aim by ‘promoting the appreciation of poetry’ outside the Circle as well as within our membership. In 2003, the Committee agreed to create a small fund for special celebration of the Circle’s Centenary in 2011 and the annual accounts record modest allocations to this fund to enable these celebrations to take place. The Centenary Sub-Committee was formed in 2009, tasked with research and planning and reporting to the Committee so that a selection of ideas could be presented to members at the 2010 AGM . Events decided on were to include a library display of poetry, photographs, and ephemera (but this was regrettably not possible due to changes at the library), the launch of and readings from every passing breeze, a ‘Taster’ reading by poets whose careers are in their relatively early stages, and a celebration dinner with a reading by Alan Brownjohn, whose various relationships and connections with the Circle (attachments indicate he attended an open meeting on 20th June 1978) and locality, and our particular enjoyment of his poetry, will make for a very special occasion. The excursions so evident in the Programmes (1966 – 1988) are not in evidence today. Nevertheless, members and servants of the Circle alike are very proud to be part of this extraordinary group. Compiled by Anne Stewart from ‘Shortlands Poetry Circle’ by LesleyMcLetchie (2009), from ‘Snippets from Programmes 1966 – 1988’ by Ann Barlow, and from the Circle’s records. 25thAugust 2010. 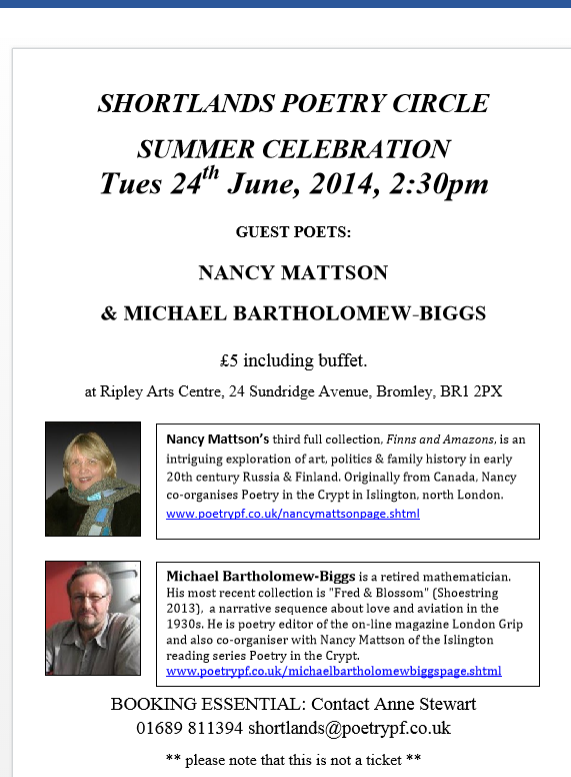 This entry was posted in Ripley Arts Centre, Shortlands Poetry Circle and tagged ripley arts center, shortlands poetry circle on June 10, 2014 by shortlandpoetrycircle.